It wasn't quite in the same class as the sensational course record-equalling, 10 under 62 that the 'flu-hit Masters champion Adam Scott produced to lead by three from Ryo Ishikawa and John Merrick. But after using the blade just 26 times, Harrington could be pleased that his scrambling instincts are not dead. His goal now is to avoid a repeat of the Honda Classic three weeks ago when also started well but fell back towards the cut line as the second round wore on and ended up missing the weekend. Staying out of the thick rough will be key for the 42-year old Dubliner, who is now 152nd in the world and has made just two of his last six cuts. But he showed some of his old putting prowess to save a raft of pars in a round feauturing nine single-putts, four birdies and just two bogeys. The bogeys came at his second and 15th holes and while the latter was a three putt from just 30 feet — he knocked the first one three and a half feet past — his misses were mainly for birdie. After rolling in a 22 footer at his opening hole, the 10th, he missed a 14 footer for par at the next but got that shot back at the par-five 12th with a wedge to five feet. He got up and down for par from bunkers at the 13th and 14th and missed an 11 footer for birdie at the 18th before coming home in one under. Another sand save at the first, courtesy of an eight foot putt, was following by birdies from 11 feet at the fourth and six feet at the fifth. That moved Harrington into the top 10 on three under at that stage but three-putted the sixth from long range and parred his way home to end the day tied for 26th on two under. McDowell was also in good form with the putter, hioling eight putts of six feet or more as he made an eagle, three birdies and just one bogey in his 68 to end the day tied for 11th on four under. 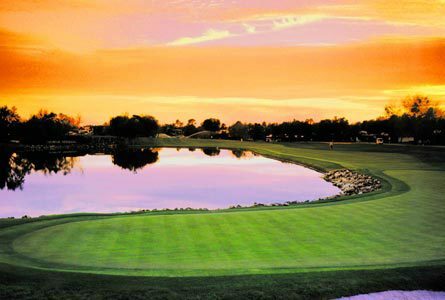 The Orlando resident had eight single putts in his round and while the 75 footer he dropped for eagle at the sixth was the highlight, he also made a 18 fotoer at the fifth, a 19 footer at the 12th and a 13 footer at the 13th in a pleasing opening effort. It was a more trying day on the greens for Darren Clarke, who shot a 75 to find himself tied for 98th on three over. The Dungannon man started with a short par miss at the 10th and then three-putted the 15th from 34 feet for another bogey, missing from four feet. He birdied the par-five 16th, two putting from more than 50 feet, but failed to save par from greenside sand at the 18th and then double bogeyed the third after pulling his second into the lake to go four over. A fine up and down from sand yielded a birdie four at the sixth but Clarke will now almost certainly need at least a 69 to make the cut on Friday. As for Scott, the Masters champion showed little sign that he was battling 'flu as he had only 23 putts and holed 175 feet in total with five of them dropping from at least 19 feet. 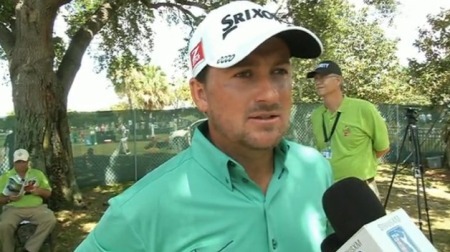 Graeme McDowell recovered from a poor outward nine to post a one under par 71 in the first round of the Arnold Palmer Invitational at Bay Hill.